“What, right now?” I said. She made it sound easy, and even though the last thing she made sound easy was NaNoWriMo, which turned out to be rather difficult, I decided she might be right about this, and invited her to join me. She was delighted. She paints for the fun of it all the time. I moved quickly, before I could talk myself out of it, and got some supplies from my creative space, which is so full of supplies, there is no room to actually do anything in there. My daughter helped me carry canvases, palettes and paints to the dining room table. We chose small canvases, so we wouldn’t be intimidated. Okay, I chose small canvases, because I’m saving the larger ones for a time when I might actually have some skill. My daughter would not be intimidated by any canvas, but they were my supplies and she had to take what she could get. She jumped right in, squirting blues and purples on her palette and painting her feelings in an abstract style. I squirted some Titanium White on my palette, followed by some cool primaries and some warm primaries. I figured that would give me plenty of options, but I still had no idea what to paint. There was no time to set up a still life and it was too wet to paint outdoors. I couldn’t back out at that point – my acrylics were drying on the palette – so I splashed on a sky. 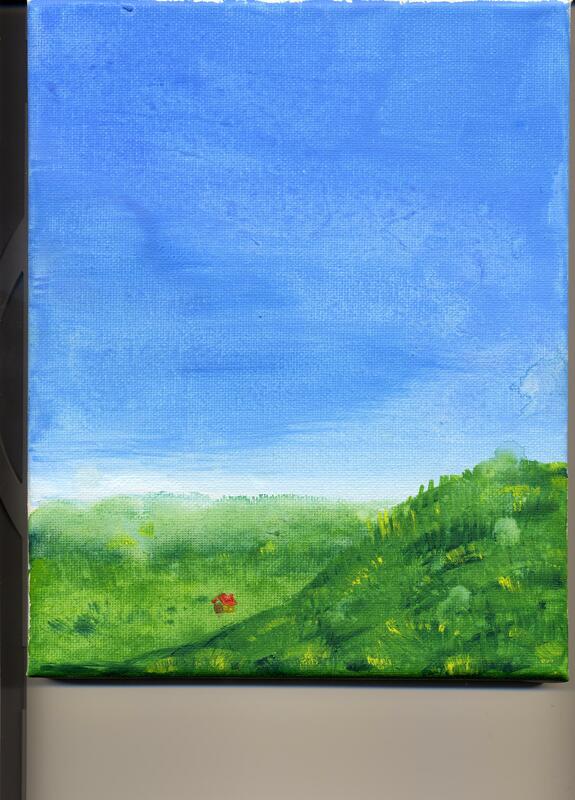 I ended up painting a lot of sky, with a field, a hillside and a tiny house. The point is, I painted. I can’t improve if I never paint. Thanks to my daughter, and the Facebook influence of my sister, I painted. It might need some happy little trees. This entry was posted in Uncategorized and tagged creativity, family, NaNoWriMo, painting on August 25, 2013 by releaf1954. Sometimes, resistance is not futile. Sometimes, it just wins. I woke up this morning knowing I had a lot of work to do in order to get the tie-dye business ready for a market day this Saturday. I also knew that I was facing strong resistance. I was tired and I didn’t want to do anything at all, much less work outside. In August. In Florida. The first thing I did, after finishing my Morning Pages, was check the weather report. Dyeing is important, but pre-soaking is the first step and that requires at least five or six hours of sunshine. In spite of the fact that I live in the Sunshine State, we haven’t had much of it this summer, so if the forecast gives me hope, I need to be putting things on the line. The Weather Channel gave me hope. Over breakfast, I checked the paper; no hope there. It said we had a 40% chance of showers. Well, obviously, that went to press hours ago, so the TV forecast should be more accurate. I checked a local station and it also said we would get no rain today. I decided to go back outside and look at the sky. It was still too cloudy for pre-soaking, but I thought I could get some dyeing done. The things that were highest on my priority list were a few items my daughter had tied yesterday – things she needs before the weekend because it’s going to be a costume day at the market. There is no way my daughter will let a costume day go by without dressing up. She needs those Rainbows! I was moving in slow motion while I set up my dyeing table. It was hot and my resistance to working outside was still strong. I was pushing myself and my self was pushing back. I threw a plastic tablecloth over my chest freezer to turn it into a dye mixing station. I set up the blender and the measuring cups and the jars of chemicals. I was determined to get some dyeing done, resistance be damned. IN YOUR FACE, resistance! Then I went to the garage refrigerator to get out the dyes that were already mixed. I shifted a quart container out of the way so I could get at the caddy that holds the eight-ounce bottles. I started to pull that out and it caught on the quart-sized container of Raspberry dye. I watched that container fall to the concrete floor and split open. Once that slow-motion fall was over, I sprang into action, picking up the container and running outside with it, dripping Raspberry dye all the way. 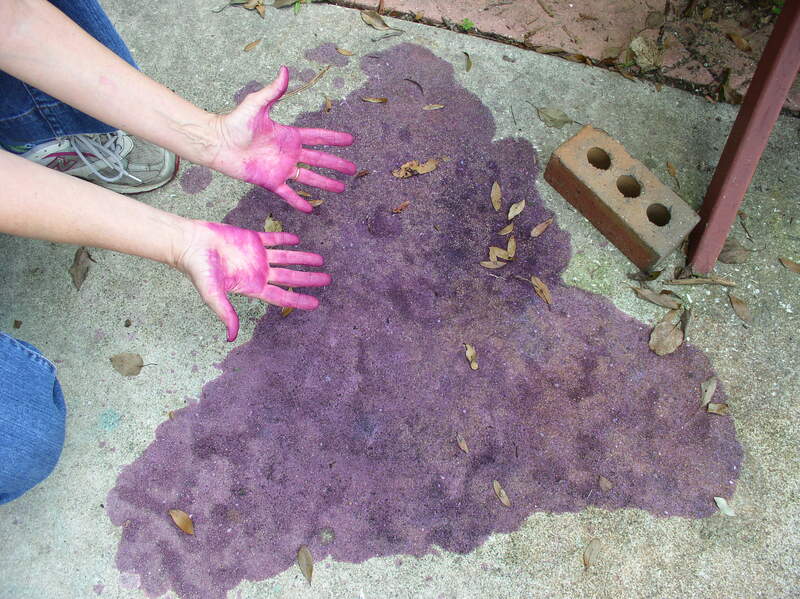 I set it down on the driveway and went in search of another container that would hold the dye. Once I poured what was left into the second container, I started cleaning up the mess, trying not to be upset about losing a pint of dye. It could have been worse. I still had a pint left. That was when I decided that the resistance had won. I don’t care what the Weather Channel says. I don’t care what my inner critic says. I don’t care what anyone says. Today is not a good day to dye. This entry was posted in Uncategorized and tagged resistance, tie-dye, weather on August 20, 2013 by releaf1954. When the procrastination feels impossible to fight, there’s one little exercise that does not fail me. 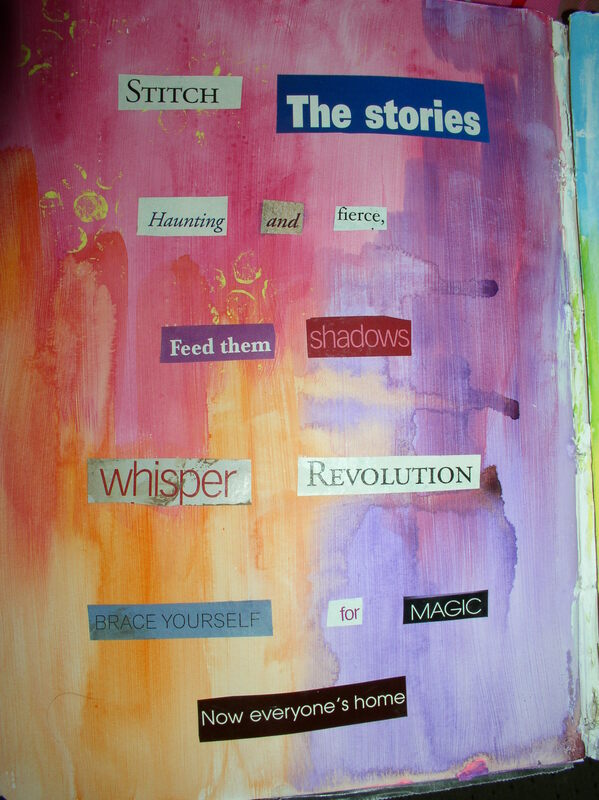 Since I couldn’t seem to make myself do anything else this week, I pasted up a poem in my art journal. For this to work, I have to have some backgrounds already made, so I can choose one to use for my poem when it’s ready. I had been playing with acrylic paint on a few pages, applying it with brushes and bubble wrap and an old credit card, so that step was already done. 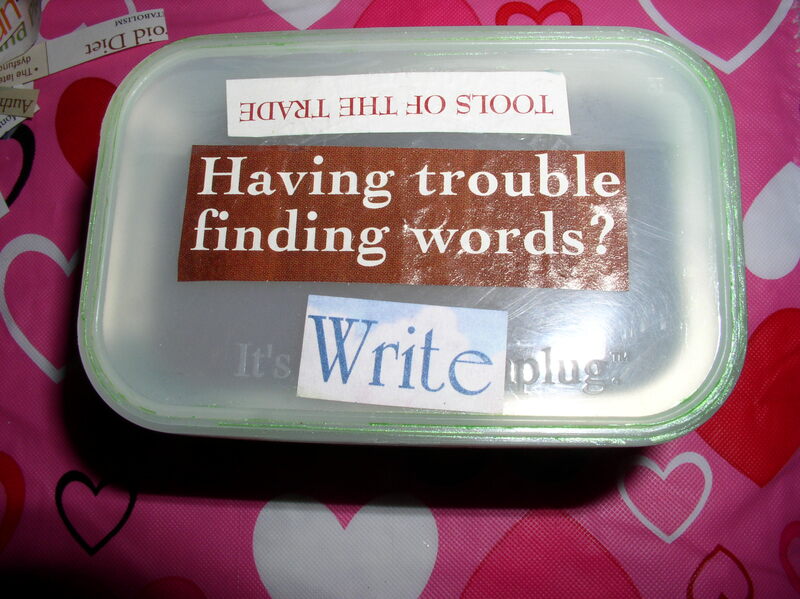 To begin a pasted poem, I needed to bring out my little box of words. 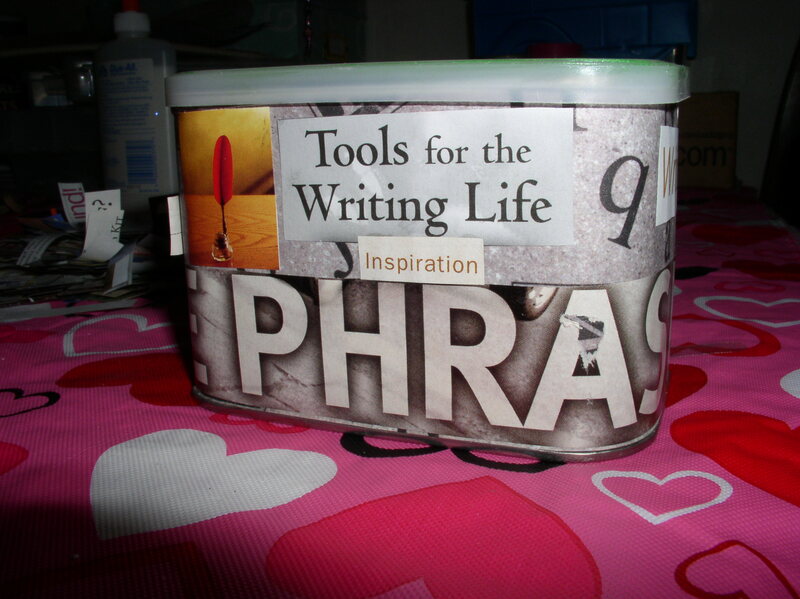 It used to be a coffee can, but I transformed it into a tool of the pasted poetry trade by pasting pretty paper and appropriate words on the outside and putting lots of little words on the inside. Sometimes it feels fun and meditative for me to sit with stacks of magazines or junk mail and cut out words to put in this can. A lot of them are single words, but sometimes a phrase will catch my eye and I’ll throw that into the can, too. When I’m really stuck for something to do and it feels as if all the creativity has drained out of me, I dump my can of words out on a table and I paste up a poem. 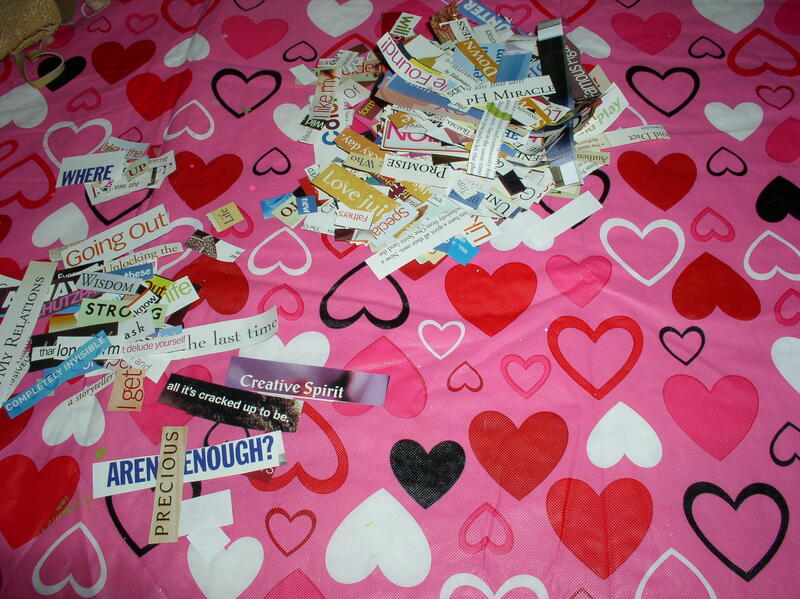 Once I have most of the words back in the can, I take a closer look at the pile of words that moved me. I go through them and see if they still move me. Most of them will join the others in the can, but a few will stand out and I will start to try to form them into a poem. I still move quickly, to keep my analytical brain from interfering with my heart. Eventually, a poem appears and I decide I’m happy with it. Then I start looking for a good page, so I can paste it into my art journal. The decision this time was based more on color than anything else. These words just looked better on these colors than they did on any of the others. It may not be a painting or an art quilt or a doll, but it’s a pasted poem, and it counts. This entry was posted in Uncategorized and tagged art journal, creativity, poem on August 18, 2013 by releaf1954. I may not have done a lot of creative things this week, but I did save Clay Jam. That ought to count for something. It’s an entire world, after all. I didn’t even buy my way through any of the levels. That was not really an option after my five-year-old grandson got his hands on the iPad and spent all my clay on power plays. I had stopped playing Clay Jam weeks ago because I had activated the Peter Principle by rising to the level of my own incompetence, a level that required me to squash four flying saucers in a row. I knew I could spend clay to skip it, but that felt like cheating. It was only a game, anyway, so I just left it alone and congratulated myself for escaping the addiction. Then my grandsons came for a visit. I thought the younger one was playing a coloring game. I looked away and when I looked back, he was busy spending all my clay on Clay Jam. Once the boys went home, I found myself re-intrigued by Clay Jam, because I wanted to earn back the clay. Also, it was the last day of the week that had passed since I put up that blog post saying I was determined to blog once a week, no matter what. That meant I should be composing a blog post, so I needed a procrastination strategy — fast! Clay Jam fit the bill. It’s colorful, it’s funny and it’s full of cute monsters. I still had four levels to beat before Ishihara would be gone and the world would be saved. I was pretty sure I couldn’t beat any of them with skill alone, but I needed to earn back a lot of clay before I could afford to buy my way through, so I did have something I could accomplish. I also had plenty of power plays, which are quite helpful when one is trying to earn massive quantities of clay. Thanks to my grandson, the game was fun again. Two levels later, I saved all of Clay Jam by knocking Ishihara more than 850 meters. You see, I do have an accomplishment to report this week. 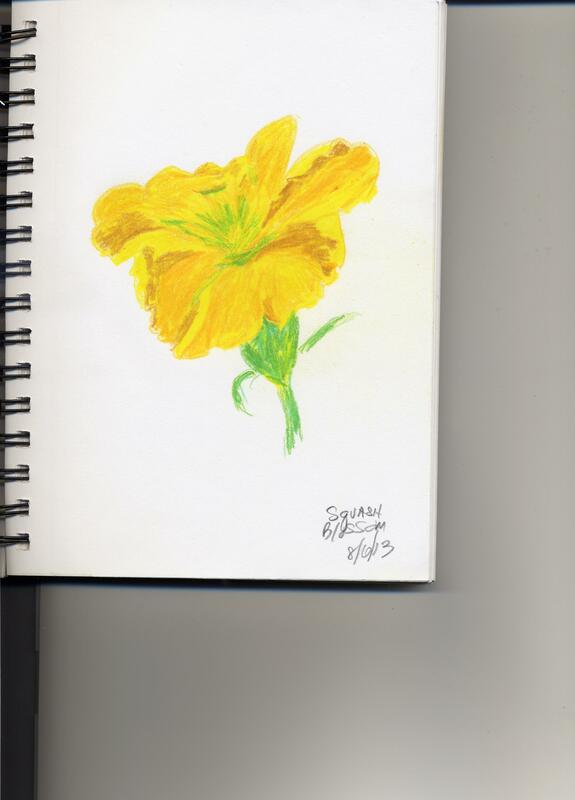 Also, I drew a squash blossom. I think I may need more Prismacolor pencils. This entry was posted in Uncategorized and tagged Clay Jam, drawing, procrastination on August 11, 2013 by releaf1954. Maybe we should. I want to keep the girls happy, but I don’t want to awaken the inner critic. These sketches are small things but they definitely count. I sketched my coffee cup. I sketched a tomato. 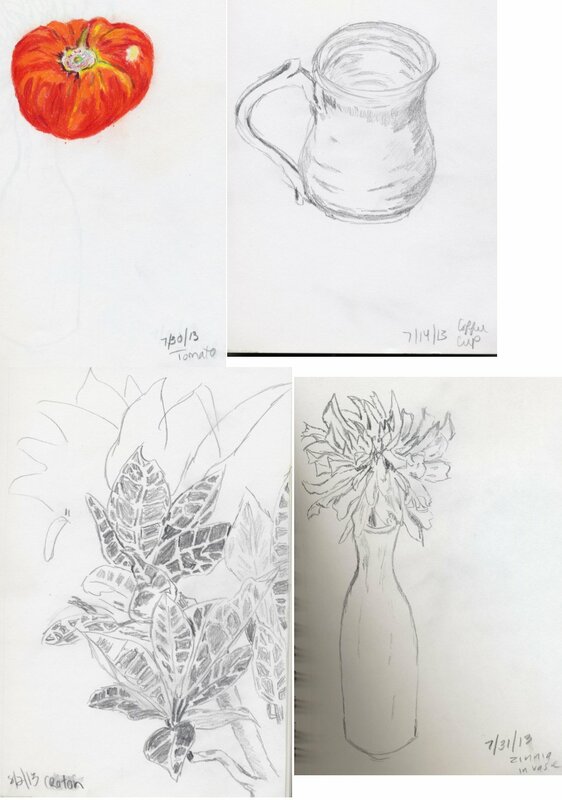 I sketched a zinnia and I sketched (or partly sketched – I ran out of time) a Croton. I used a plain graphite pencil for three of them, but that tomato just demanded some color, so I pulled out some Prismacolor pencils for that one. I wasn’t very happy with it, but my daughter said the problem was that I needed a colorless blender pencil. She had a spare, so she gave it to me and it did make a big difference. A lesson learned. I learned a few other things while making these sketches. I am a victim of inertia. If I am doing nothing, I want to keep doing nothing. If I can just get myself to start something, I want to keep doing that. I started the Croton sketch while I was waiting for some pre-soaked items to dry on the line. Clouds were gathering and I was afraid that if I waited inside, I might not notice if it started raining. I took a sketchbook and pencil outside, along with a tall glass of Coke, and I looked for something to sketch. I sat in a lawn chair in the shade and pulled up a potted Croton. The left side of my brain was appalled. “That’s way too complicated,” it said, “there’s no way we can draw that!” The right side of my brain just dove in and waited for the left side to get bored and go away. It worked! When it was time to check the pre-soaked stuff, I didn’t want to stop drawing. My daughter does not like to tie things that are bone dry, though, so I had to stop and pull the pre-soaked items from the line. I still felt like celebrating because, for a little while, I was able to lose myself in a creative activity. It’s been a long time since I’ve done that. Maybe we should do the happy dance. This entry was posted in Uncategorized and tagged fifty things, graphite pencil, right side of my brain on August 4, 2013 by releaf1954.